The AT&T Office@Hand Mobile App allows you to join conference calls. 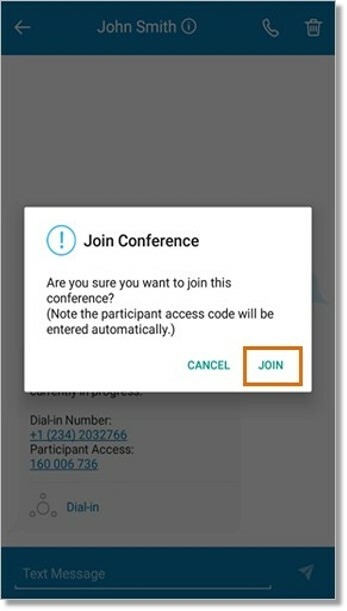 When enabled, Participants may join the conference before the Host logs in. Participants may join by dialing the Dial-in Number or tapping the invite link. 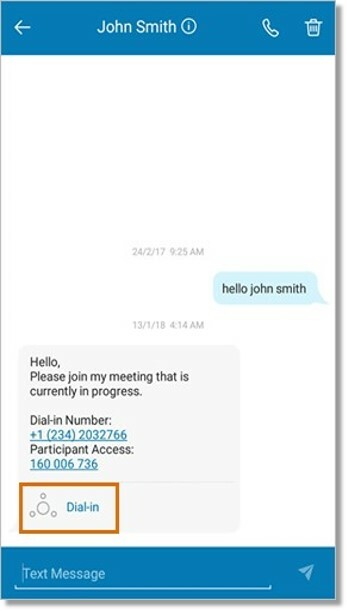 AT&T Office@Hand Users and their clients who are non-AT&T Office@Hand Users can join an AT&T Office@Hand Conference call by calling the Dial-in Number specified on the invite they receive through regular SMS or Email. When Participants call the Dial-in Number, they will be asked to enter the Participant Code. The Participant Code will allow Participants to join the conference. The AT&T Office@Hand’s Conferencing Dial-in Number is (605) 562-3190. Participants from an International location can also join the Conference by calling an International Dial-in Numbers. Message invite that you receive through your AT&T Office@Hand Mobile App. Your AT&T Office@Hand Mobile App will automatically dial your Conference Dial-in Number with your Access Code. Note: You may Host or Tap-to-Join a conference call without the need to enter an access code when VoIP is not available through RingOut. If you use Ring-Out, you phone will call the Dial-in Number using your carrier’s minutes. To enable RingOut, you must disable VoIP Calling on your device.